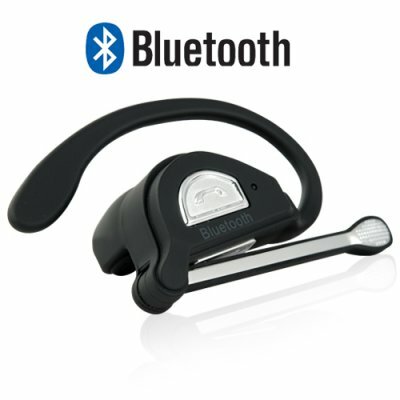 Successfully Added Bluetooth Wireless Headset - Ultra Comfort Earpiece to your Shopping Cart. New Bluetooth Wireless Headset type earpiece with lightweight over-the-ear clip design and mini boom mic. This is a great communication companion to your mobile phone, for convenient, handsfree operation. With integrated Bluetooth now a standard feature in modern mobilephones, from high-end smartphones to low-end functional models, this compact Bluetooth earpiece is a must-have accessory for anybody who uses their cell phone regularly. Designed specifically for convenience and comfort, the ergonomically designed CVSB-B14 Bluetooth Wireless Headset - Ultra Comfort Earpiece provides you with high quality audio and includes a high response folding boom mic that always clearly picks up your voice. Simple to use and accessible, this Bluetooth Wireless Headset is manufactured with a molded polymer in a perfectly contoured shape that makes it fit securely on your ear for hours of comfortable use. Add to that its single press button on the earpiece that allows for convenient control of standard functions including answering and ending calls plus a rocker switch style button for volume control, and you may just wonder why it ever took you so long to get a Bluetooth earpiece! Charge up the unit overnight (6-8 hours) before its first use, this will provide you with peak battery performance for the life of the product. Bluetooth version 2.1 for faster pairing and connection, improved call quality and lower power consumption. Also compatible with Bluetooth version 2.0, 1.2 and 1.1 devices.